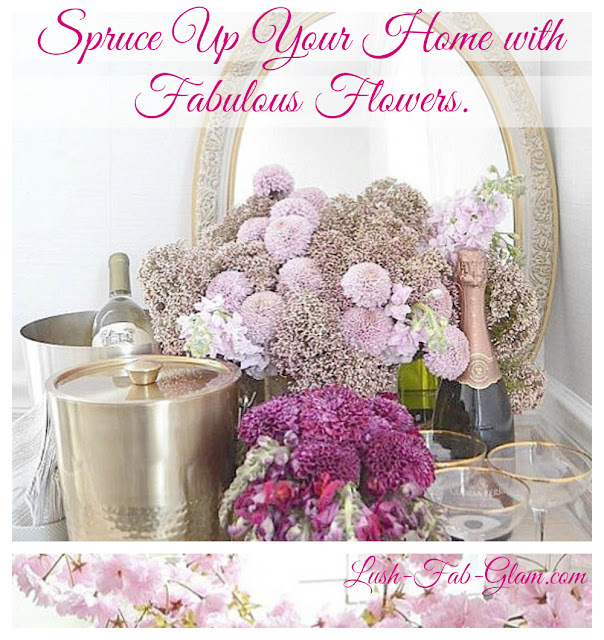 Lush Fab Glam Inspired Lifestyle For The Modern Woman: Spruce Up Your Home Decor With Flowers. 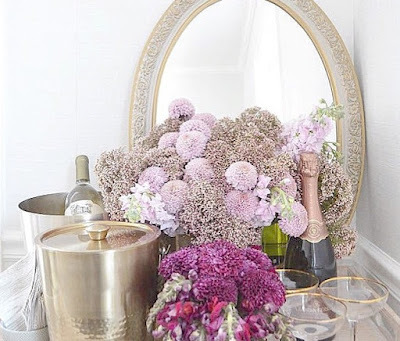 Spruce Up Your Home Decor With Flowers. 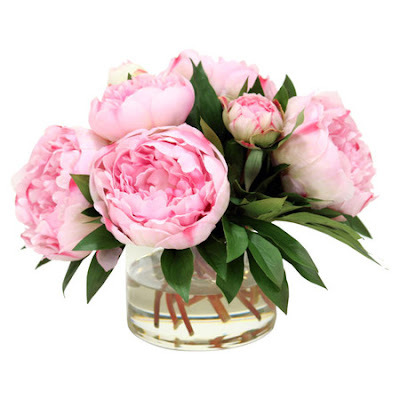 Spruce Up Your Home Décor With Fabulous Flowers. 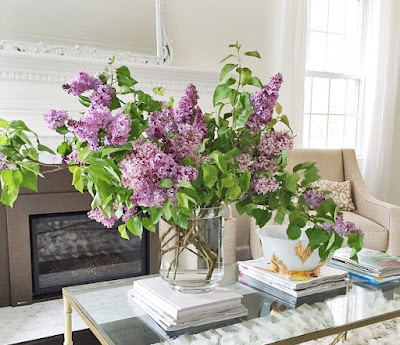 One of our favorite things about the spring and summer seasons are the gorgeous blooms. Exploring beautiful gardens, flower parks and quaint flower shops in the new cities that we visit is a must as we satisfy our wanderlust. 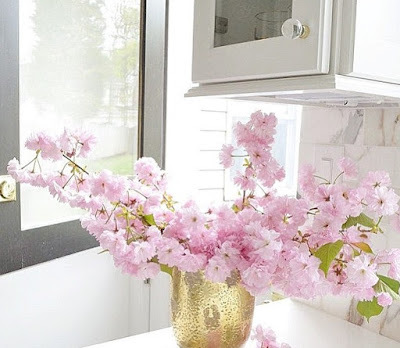 Add color and beauty to your home with lovely flowers that bloom bountifully during the spring and summer season like peonies, cherry blossoms, lilacs and hydrangeas. 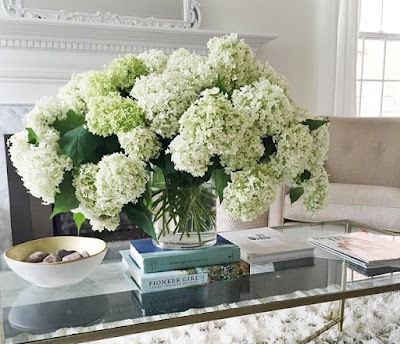 White and Green Hydrangeas Bouquet. Floral Décor Tip 2: Maximize Your Bouquet. 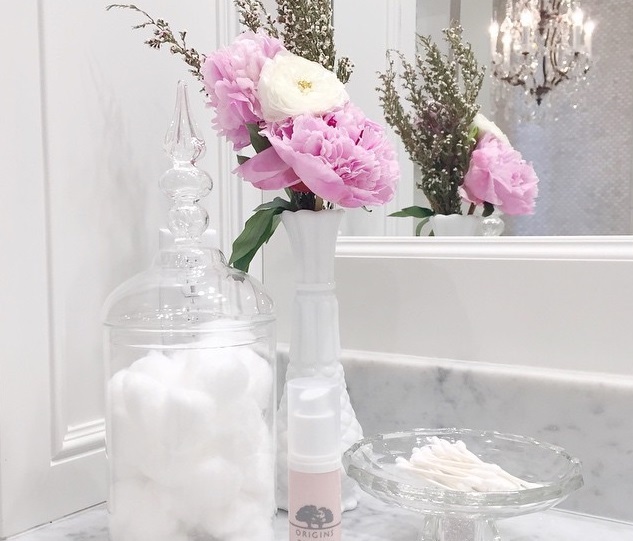 Flower purchases can be expensive especially when you're going for the best, save money and enjoy flowers in every room of your home by creating smaller bouquets that contain one to three flowers each. 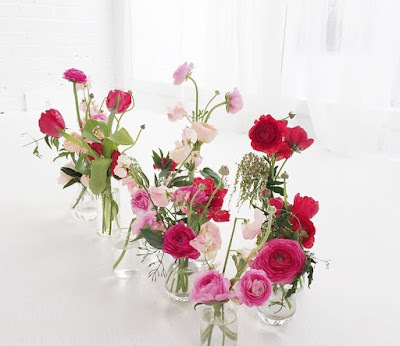 Group your mini bouquets in a linear form for a dynamic table centerpiece in your dining room or spread around your home for subtle but beautiful bursts of color in different rooms. 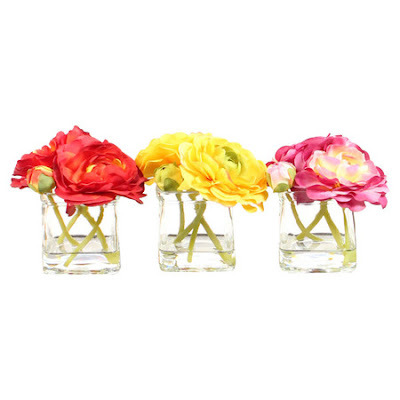 Mini bouquets displayed in glass goblets of varying shapes and sizes. 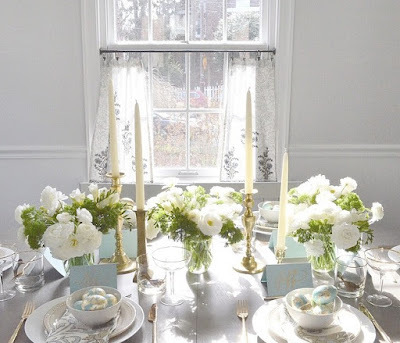 Elongate the look of your dining table with a short and linear bouquet arrangement. 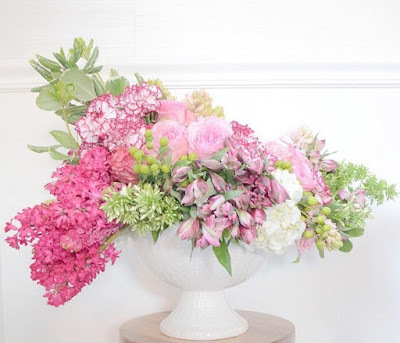 Create a glamorous burst of color by displaying a variety of colors of the same flower. 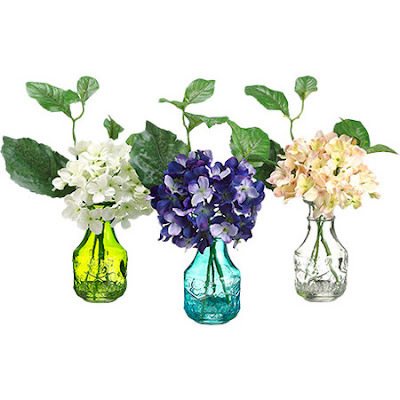 Single stem Hydrangeas displayed in mixed color mason jars. 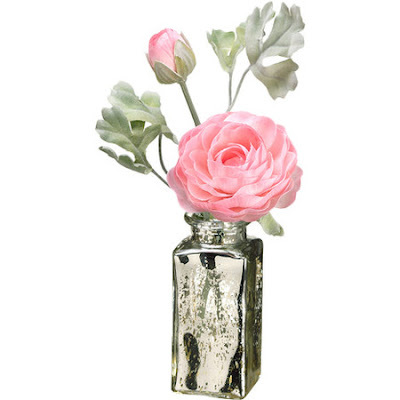 Display your mini bouquet in an eye-catching mercury jar that will draw the eye away from the size of your bouquet and to it's overall elegance. 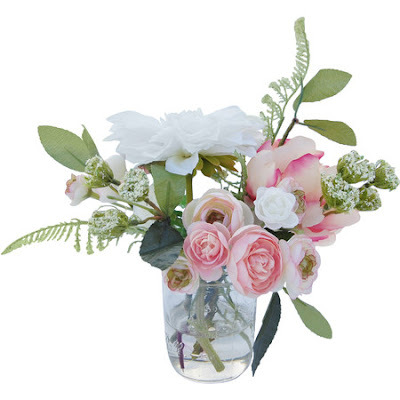 Mix and match your favorite flowers to create an eye catching floral bouquet arrangement. Complimentary colors make for an elegant bouquet while contrasting colors add pizazz. Carnations, roses, hydrangeas and lilacs mixed bouquet. Carnations, lilies and snap dragons mixed bouquet. 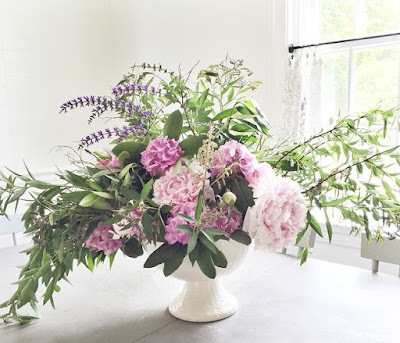 Make use of leafy branches to create fuller and more affordable floral arrangements like this spirea, blue salvia, peonies, rhododendron and pink astilbe bouquet. Pink peonies and white lily mixed bouquet. 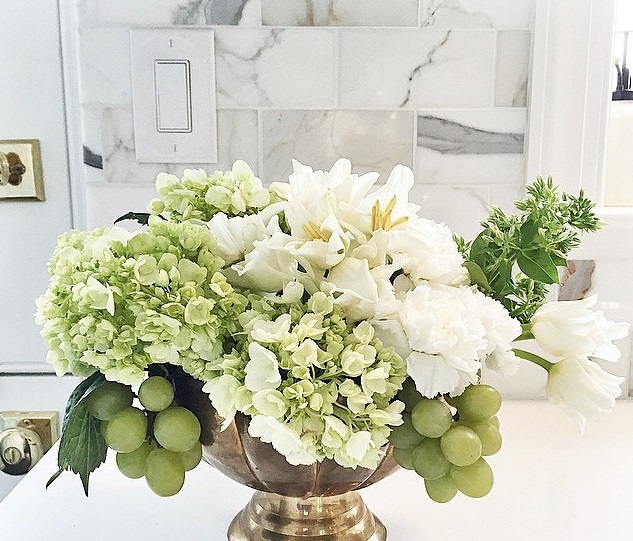 Floral Décor Tip 4: Make A Statement. There are so many ways to explore your creative side and take your bouquet to the next level. 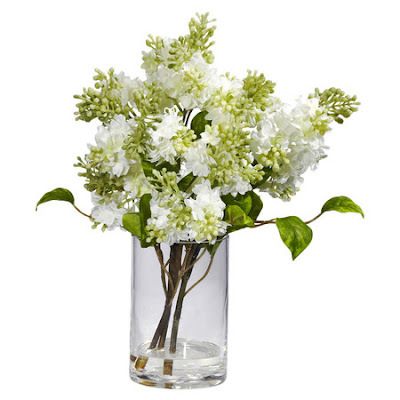 Add unexpected things like lemon or orange slices into your clear vase for a dramatic look. 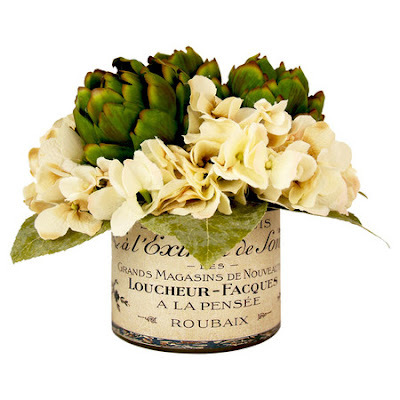 Or add vintage/Parisian flare with a brass vase or by wrapping an old news paper/ vintage wrapping paper around your vase. Hydrangea, tulips and white carnations bouquet embellished with green grapes in a brass vase. Shades of pink... rice flower, snap dragons and mums bouquet in a gold vase. 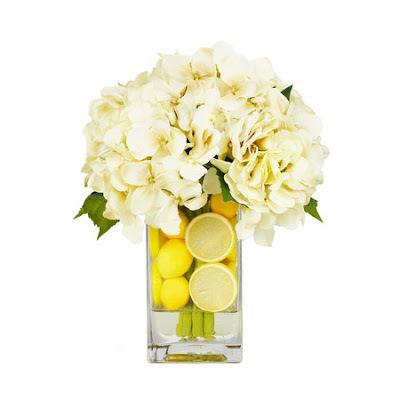 White Hydrandrea bouquet in a glass vase embellished with lemon slices. 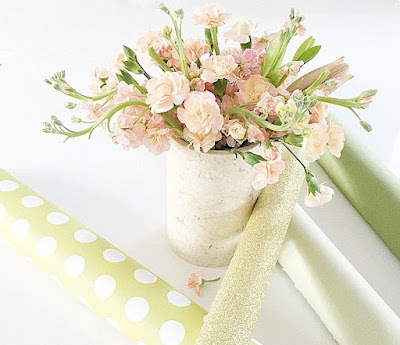 Add a classic and vintage flare to your bouquet with an easy D.I.Y paper wrapped vase. Floral Décor Tip 5: Easy-Breezy Potted Plants. 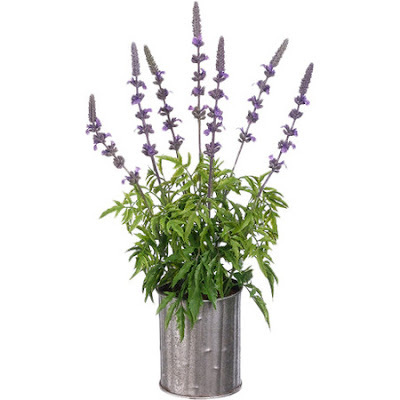 Get longer lasting flowers with potted plants like lavender bushes and orchids. 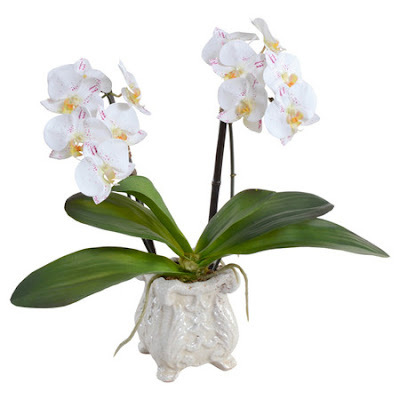 They add an elegant touch, are easy to care for and are certainly more budget friendly. Lavender bush in a re-purposed tin can vase. Décor Tip 6: Display Your Pretty Flowers EVERYWHERE! No place in your home is off limits and each room's decor will be enhanced when you add fresh cut flowers from your garden and beautiful blooms from your local florist or supermarket. Sit back relax and enjoy the weather and fabulous floral décor. Pink Peonies in the bathroom. 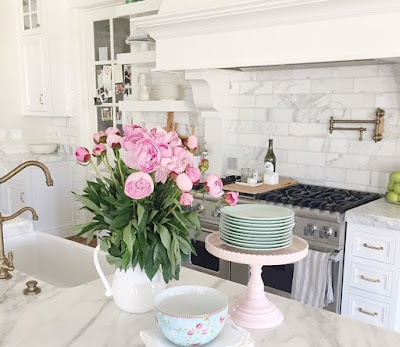 Pink Peonies in the kitchen. Rice flower bouquet displayed in a bar cart. Planning a fabulous party? 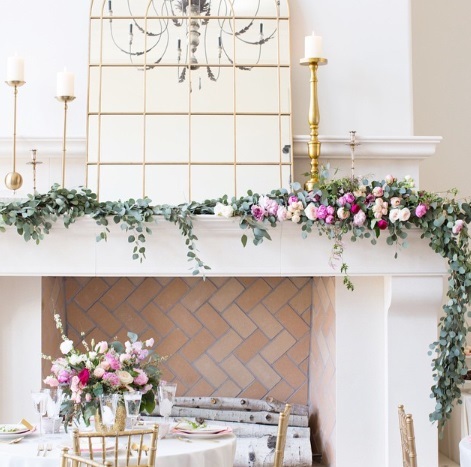 Decorate your fireplace mantle with gorgeous flowers and fresh cut vines. 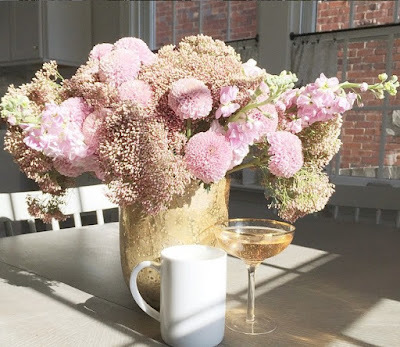 Photos via One Kings Lane and our favorite Instagram flower display arrangement bloggers @ifalc and @rachparcell. What's your must-have flower bouquet during the spring/ summer months and which featured bouquet do you love? Share with us by leaving a comment below.